Have you seen Train to Busan yet? In case you have been living under a rock these past few weeks, Train to Busan is one of the hottest movies to hit the screens during the second half of 2016. This movie from South Korea is a zombie apocalypse thriller starring Gong Yoo of the hit Korean drama Coffee Prince, Jung Yoo Mi (The Crucible), and Ma Dong Seok (The Neighbor). The gripping film made its debut in the 2016 Cannes Film Festival and has attracted almost 10 million moviegoers, earning as much as USD 99 million in the worldwide box office. 1. Busan is only about four hours away from Manila or about two hours away from Seoul. Philippine Airlines and Cebu Pacific have daily flights from Manila to Busan, with travel time lasting for about four hours. Some travelers enter South Korea through Busan and then exit in Incheon, while others do it the other way around. Keep an eye out for the frequent seat sale announcements so you can score cheap flights! 2. Busan is to South Korea what Baguio is to the Philippines. If we Filipinos have Baguio as our “Summer Capital,” the Koreans have Busan. However, unlike Baguio, which is on a mountainous terrain and has a temperate climate, Busan is located at the southeastern tip of the Korean peninsula and has a warmer climate than Seoul. 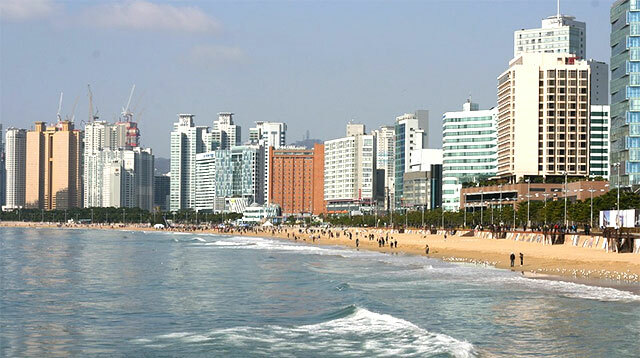 Busan is also where you’ll find Haeundae Beach, one of the most beautiful beaches in South Korea. Its coastline spans 1.5 kilometers long with its southern end being a popular spot for fishing. 3. Busan has a temple both in the mountains and by the sea. 4. Busan allows you to explore nature right within the city. Taejongdae is a natural park which is designated as a Busan monument. The park is set amidst lush greeneries and with a spectacular ocean view greeting its visitors. You’ll also find an observatory, a lighthouse, a coastal walkway, and a hot spring. Two temples—the Taejongsa Temple and the Gumyeongsa Temple—are also found onsite. 5. Busan is home to the largest shopping mall in the world. 6. Busan hosts the Busan International Film Festival. 7. Busan is home to sumptuous dishes you simply cannot miss.